Media Credit: Photo courtesy Citizen Burger Bar. Citizen Burger Bar expects to open a Clarendon location in December. The new burger joint features locally brewed beers and burgers made with beef from Virginia farms. Few foods are considered more “American” than a good old-fashioned burger. Citizen Burger Bar, the self-proclaimed “people’s burger bar,” isn’t just embracing its patriotic reputation: It’s crafted a menu around it. The restaurant, which plans to open a Clarendon, Va. location in December, spotlights locally brewed beers and features burgers made from beef raised on nearby Virginia farms. “If you’re going to eat meat, this is how you do it,” reads the menu at its Charlottesville, Va. location. Owner Andy McClure called burger joints the “perfect combination of being hip and fun but still classic and approachable.” And he said combining the classic burger bar feel with a focus on local fare gives McClure’s restaurant an edge as more burger joints compete for customers. “Citizen’s is the type of place you go for a big juicy burger and high-quality beer,” McClure said. From lagers to IPAs and wheat beers, the menu offers over 100 types, each with its own story, and often coming from local Virginia breweries. The Devils Backbone Vienna Lager, a local crowd favorite and award winner, “is just one of those beers that goes so well with our burgers,” McClure said. And McClure himself has gotten to know some of the brewmasters, taking pride in the breweries he chooses to feature on his menu. Citizen’s burgers are made with local buns iron-stamped with a large “CB,” local cheeses and grass-fed, grass-finished beef. This beef, coming from farms in Virginia, has a fresher flavor and is different from the typical ground beef you’d buy at a grocery store, McClure said. “I always joke and say it might save the world some day,” he said. In addition to the signature Citizen Burger, which is topped with a fried pickle, crowds at the Charlottesville location love the truffle fries, lobster club and shishito peppers (Japanese peppers paired with soy sauce and ranch dressing). 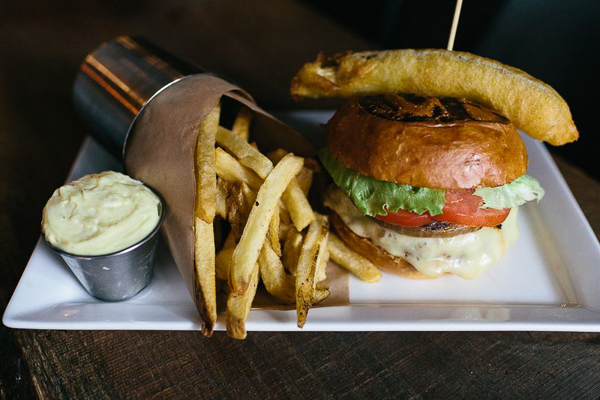 Citizen Burger Bar can also please the wine lover, featuring choices from Virginia wineries. McClure hopes the Clarendon neighborhood will welcome the restaurant, whether customers include crowds of sports lovers coming for game day or families taking advantage of great options for children, like the mini burgers. Though the D.C. area has been overrun by fast-casual burger places, like Shake Shack, Bobby’s Burger Palace and Five Guys, McClure said his full-service burger bar model makes Citizen stand out.